Every day in the UK 50 people face a brain tumour diagnosis and its life-changing effects, with more than 55,000 people in the UK currently living with this type of cancer. 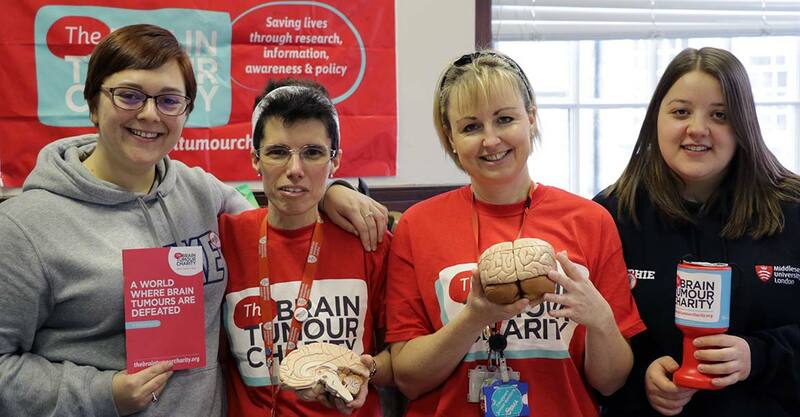 To raise awareness, and much-needed funds to support research, The Brain Trust Charity and The Brain Tumour Charity have organised the national Brain Tumour Awareness Month – and it launched at Middlesex in March with a day-long event designed to teach people about the condition. Students and staff from the adult, child and mental health nursing degrees were invited to attend the event and take part in a range of activities to increase their knowledge and understanding of brain tumours. The event was organised by child nursing lecturers Carolyn Perriman and Jenny Phillips. Carolyn was inspired to help her students learn more about brain tumours after a member of her family was diagnosed with the condition. “Through this family journey I became aware of my own limited knowledge and awareness of this condition, and as a health professional I felt that this was something that needed to change,” she said. Third year BSc Nursing (Child) students Bethany Easterbrook and Sophie Hogg are about to begin the final hospital placement of their degrees but took time out from their dissertation preparation to get involved in the event. “In our lessons we don’t have time to cover every single condition we could come across as a nurse so when this was organised I thought it was a great opportunity to learn more,” said Stephanie. Part of the motivation behind the campaign is to highlight the fact that despite more people under 40 dying of brain tumours than any other cancer, brain tumour research currently receives less than one per cent of all cancer research spending.